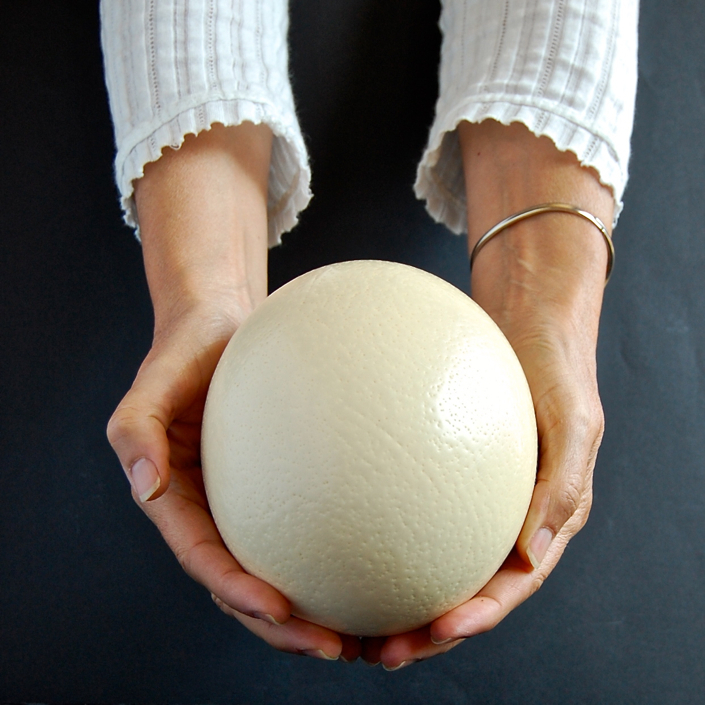 Have you ever weighed up an ostrich egg, would you like to know how it feels among your hands? Is the surface smooth or not? How could you break it if you want to cook it? How many people would feed? Would you like to know all about it? First of all, we need to find a City Market with a well assorted eggs shop. I found mine in one of the most beautiful markets of the City: Santa Caterina Market, which is really near Barcelona’s Cathedral. Besides Boqueria Market, you will find Santa Caterina’s inside a beautiful building with less shops than in Boqueria but in a cozy and delicious environment. You can have a fantastic lunch or a tapas aperitif at the bars and restaurants inside the market after you get what you want in the shops. Make sure the shopkeeper wraps it up carefully so that it doesn’t break during your way home. It is kind of heavy, mine weighted 1,427 grams. Once you get home it’s very important that you place it in the fridge because we want it to be cold when we cook it. The surface feels like it looks, it’s really smooth and it has this micro holes all over. One of the things one wonders when buying this huge sized egg is how long can it stay in the fridge before using it. So I did ask the question and was told that it can be kept in the fridge for 4 months! I didn’t want to take any risks so after 1 month and when I needed that space in the fridge back, I made up my mind and here is the result: An Ostrich Egg Burger! It seems to be the simplest solution for such an over-sized egg… all the other ideas I had were too complicated… I thought about making mandalas with the slices, a huge fried egg, a giant tortilla de patatas… But with the burger idea, the shape and size of the bread was just perfect for the egg’s slice and the rest of ingredients matched so well. See? I bought these wonderful, seasonal, fresh sardines; also these piquillo peppers, of course there had to be some lettuce and the queen of our sauces: Allioli. Just my kind of burger! Believe it or not, I needed a hammer to break the Egg’s shell!!!! Once boiled (it took 1 1/2 hours), what shocked me the most was the appearance and colour of the white… it wasn’t white! It might look white in the pictures but it wasn’t, it was some kind of ivory and the texture a bit gelatinous. Maybe if I had it boiling longer it would have been whiter and thicker. 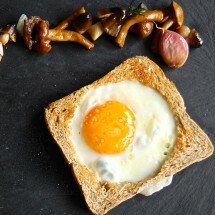 Besides these observations, the taste was more or less like a hens’ egg. I would seriously consider this Burger for a party… think about it… 1 egg feeds about 8-10 people (2 slices per burger) and in case you don’t want to fry the sardines you can always have some smoked salmon instead and if you don’t want to prepare allioli, serve it with mayonnaise :D.
So, you can stop wondering what was first now! 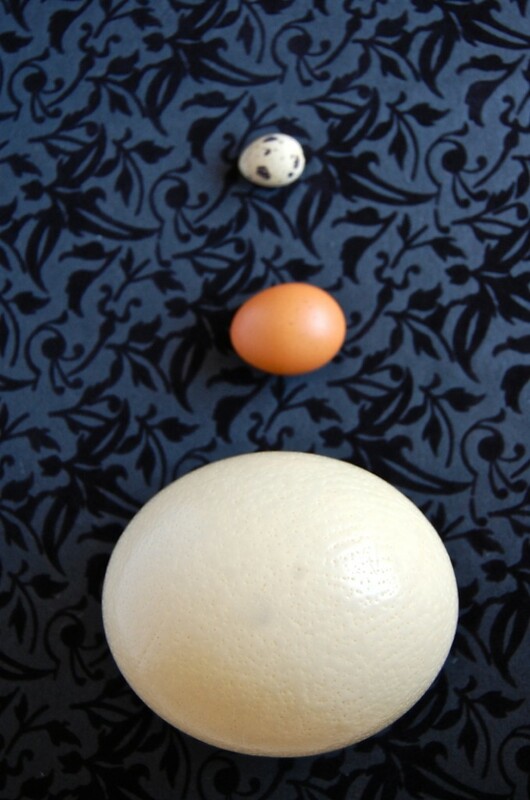 The Ostrich Egg, of course. 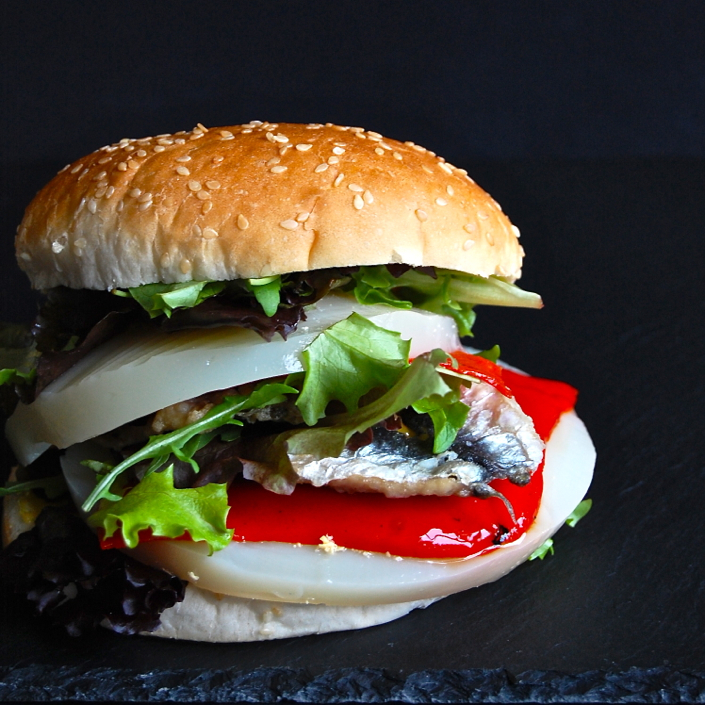 Ingredients for 8 - 10 servings: 8 to 10 bread burgers, 1 can of piquillo peppers (you can roast your own if you like), 20 fresh sardines, 1 package of different lettuce leaves (fresh and clean), 1 Ostrich Egg. 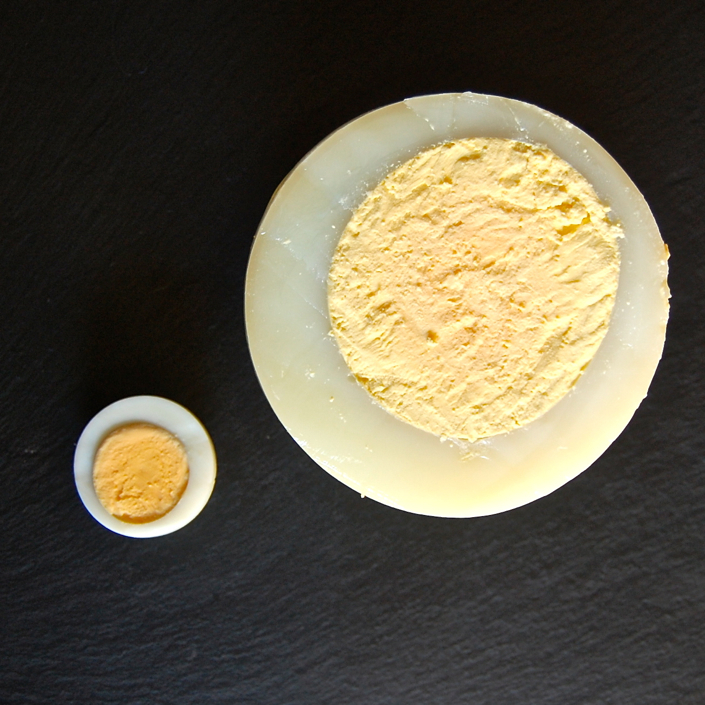 And for the allioli: 1 hen's egg yolk, a pinch of salt, 1 garlic clove, extra virgin olive oil. First of all take the biggest pot in the kitchen you have, fill it up with water, put the ostrich egg inside and bring to boil. Boil for 1 1/2 hour. After that, place inside a big bowl with fresh water and let it rest. 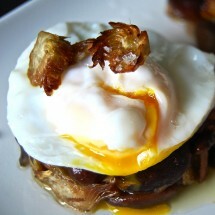 Start your allioli (follow the link to get the recipe) and reserve. Clean the sardines (take their heads, guts and spine out), wash under tap water and reserve. Salt the sardines. Pour some olive oil inside a pan. Coat the sardines in flour and fry. Reserve over kitchen paper. 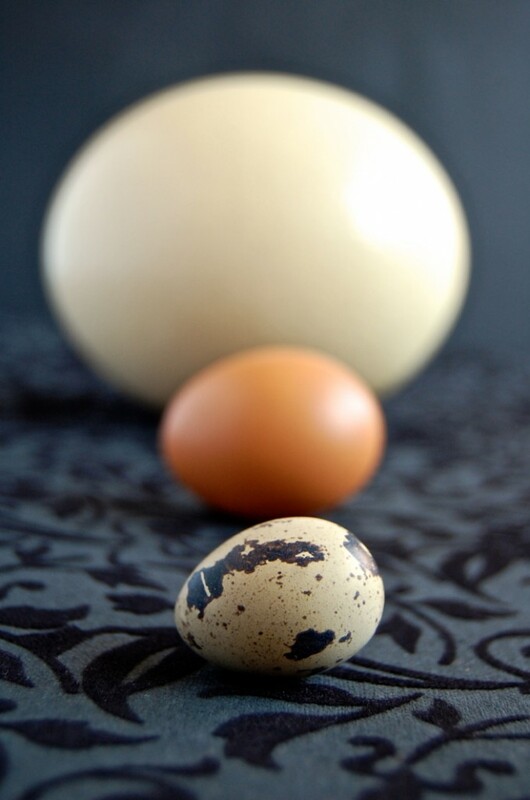 Use a hammer to crack the egg and get a sharp knife to cut in slices. Use two per burger. Open the piquillo can and use two piquillos per burger. 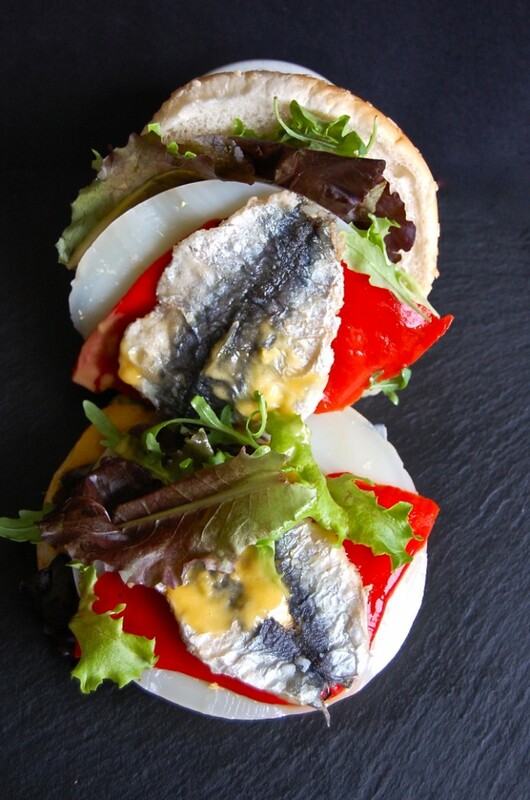 Spread the allioli over the burger surface, place some lettuce leaves, place the egg slice, the piquillo pepper and the sardines. 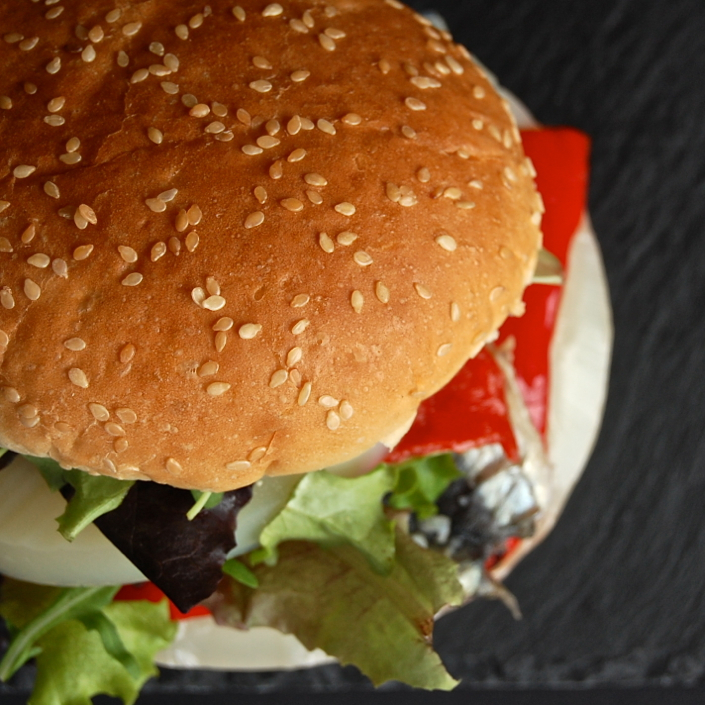 Is there a healthier burger?